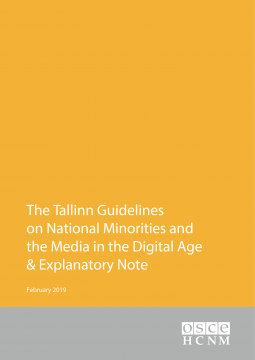 Building on the 2003 Broadcast Media Guidelines, the Tallinn Guidelines were issued by the OSCE High Commissioner on National Minorities (HCNM) in February 2019 to take account of the advent of the digital age and the profound consequences of society’s growing reliance on digital technologies for the media environment. Created in 1992, the HCNM is mandated to contain and de-escalate tensions involving national minorities within the OSCE area, by providing early warning and/or action in case of potential conflict. According to the HCNM, national minorities* and their representation through media play a key role in preventing conflict and peace-building. States should thereforce ensure spaces for inclusive debate in diverse societies by protecting all participants in the public debate and ensuring the sustainability and vitality of pluralistic media. Freedom of speech and freedom of reception: freedom of speech includes “the right to seek, receive and impart information, regardless of frontiers, in the languages and through the media of their choice”. States shall not prevent the dissemination or rebroadcast of foreign media, save in strict accordance with international human rights. Protection and independence: States shall take all appropriate measures to fulfil their positive obligation to create an “enabling environment for a robust, pluralistic public debate” and to effectively provide practical and legal protection to any participant. According to the HCNM, such environment necessarily requires a culture of independence in the media sector and notably, independent national regulatory bodies. Media literacy and accessibility: States shall ensure access to electronic communications with quality and affordable prices for all and enable everyone “to access, understand, critically analyse, evaluate, use and create media content”. Pluralistic landscape and licensing scheme: translation, production and equitable dissemination of contents shall be encouraged and supported, as well as regional and/or local media. In this regard, among other proposals (Section III), the guidelines state that the licensing scheme should be used in order to promote national minority communities, with dedicated programmes and/or channels for instance, and administrated in a “fair and non-discriminatory manner by designated independent authorities”. These authorities should furthermore be required to “issue information and guidance on the opportunities and requirements for minority media within existing licensing schemes”. Public Service and Community Media: independence and sustainability of PSM shall be guaranteed in order to allow them to “fulfil their mandate to serve all sections of society, including national minorities”. There is an emphasis on the need for translation and dissemination of public service contents, and especially public service announcements. The guidelines encourage furthermore the recognition of the distinct nature of non-profit community media and the guarantee of their independence. Internet intermediaries shall be encouraged to respect “human rights due diligence throughout their operations, to take account of any particular implications for the rights of national minorities while doing so”, and to adopt a clear and transparent policy; they should not be held liable regarding third-party content published through their services or networks. To achieve this goal, and in particular to draw up, adopt and implement clear policy, co-operation and active engagement between all players are paramount. This also includes national media regulatory authorities and the guidelines emphasize that the independence of regulators is an important requirement. NRAs are furthermore encouraged to involve women and men belonging to national minorities in their own structure and in all the work processes relevant to such groups, with due respect for gender equality. *In these guidelines, national minorities are defined as follows: “a wide range of persons belonging to national minorities, including ethnic, religious, linguistic and cultural communities, regardless of whether these groups are recognized as such by the States where they reside and irrespective of the designation applied to or claim by them”.